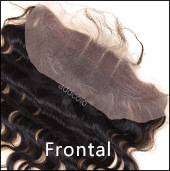 Compared with 4*4 Lace Closure, 13*4 Lace Frontal is a larger hair closure with flat and undetectable hairline. At Addcolo, we offer versatile and high quality, 100% virgin Remy Human hair of Chinese, Indian and Brazilian origins. Stock size and custom order also accepted.